Stimulates nerves on the skin and hair. Directly used on the body to help align your physical structure, the Otto Tuner resonates the bones, stimulates the nerves and releases tension from the body. Vibrating your bones with deep earth tones, the Otto Tuner brings a sense of deep relaxation and soothing peace. It relieves muscle tension, spasms, pain, and improves circulation by relaxing constricting muscle tissue and causing increased blood flow. Deep relaxation and soothing peace. Relieves muscle tension, spasms, and pain. The 128 Otto Tuner is especially effective when placed on the rib heads, thoracic vertebra, sternum and illiums. 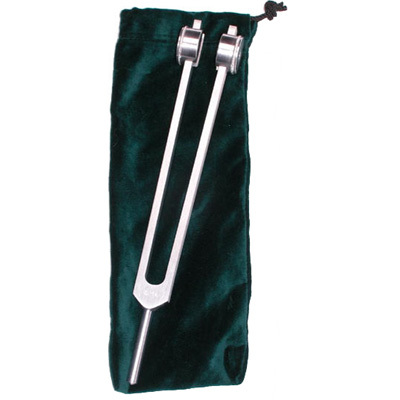 Two Otto Tuners tapped gently on the knees and held to the ears create a beautiful sustained low tone, which is excellent for grounding and relaxation. The 64 Otto Tuner is especially effective when placed on the lower lumbar vertebrae, sacrum and coccyx. Its vibration helps loosen the sacral ligaments as well as stimulating and balancing the ganglion of impar, a centre for controlling the balance between the sympathetic and parasympathetic nervous system. The 32 Otto Tuner works with your skin and hair to stimulate nerves.